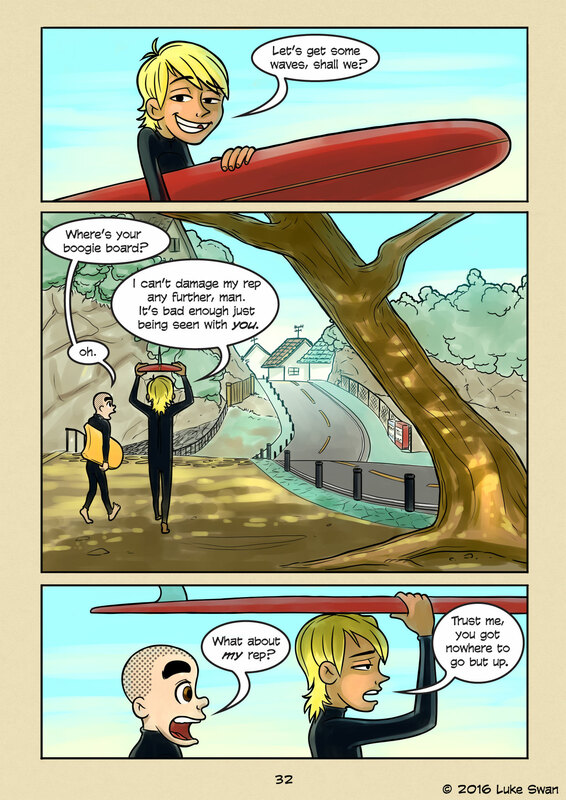 Damaged Rep (#032) | Web comic "Surfer Joe"
Do you ever fear damaging your rep? A person’s reputation is a weird thing. I don’t know about others, but I honestly have no clue what my “rep” is. Although there was a time not too long ago where I was worried about damaging said rep. It drove me nuts, I was super stressed out all the time. Seems silly looking back to be worried about something that you never paid attention to. But that’s what people worry about the most, things they don’t know or understand. And I don’t understand how I am perceived by others. No biggie, I stopped trying to figure it out and I’m happier for it. I was trying to remember what Shobuta-Hama looked like. Y’know, before March 11. I searched for pictures, both on the internet and my private collection. But couldn’t find any. So I had to draw the scene from memory. I remember vending machines across the street. Posts lining the emerald sidewalk. I remember a dense neighborhood on the other side of the hill. But I can’t remember exactly. It’s a little strange because it’s the beach I grew up on. We spent the majority of our summers there during my childhood. And in the year 2000 my parents moved up there permanently. Needless to say I’ve spent a ton of time at Shobuta. I consider it home. And yet I can’t remember what it used to look like… I guess that’s why people take photos, so they don’t forget. It was a fun background to draw, and invoked a few memories. I caught my first wave here. Got my first fin cut, too. I remember about 15 years or so ago camping out on the beach with a group of salty old surfers. We made a huge bonfire, got drunk and had a pretty awesome drum circle going. It was strange, just an organic meeting of like minded people bonding over their love of the ocean. It’s funny I wasn’t even a surfer back then, but I wanted to be. I was scared to death of the ocean. I guess I just didn’t understand it at the time. But I wanted to. New Surfer Joe content every Wednesday & Saturday.